With only one half-week left of the Coin Arc, Greenies have been busy wrapping up a number of projects. For the past few weeks, students have been planning and filming their History of Money movies, preparing styrofoam casts to be made into aluminum coins in a foundry, and studying the realities of having a minimum wage job in San Francisco. Gita, Lucy, Charlotte and Demar getting their costumes and props ready for filming. 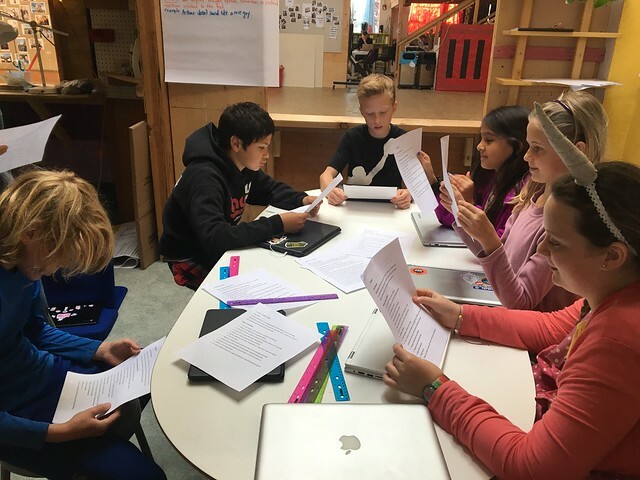 Based on the book The History of Money: From Bartering to Banking by Martin Jenkins and illustrated by Satoshi Kitamura as well as some articles we read on the same subject, Greenies are working in two groups to make short movies about the history of money. 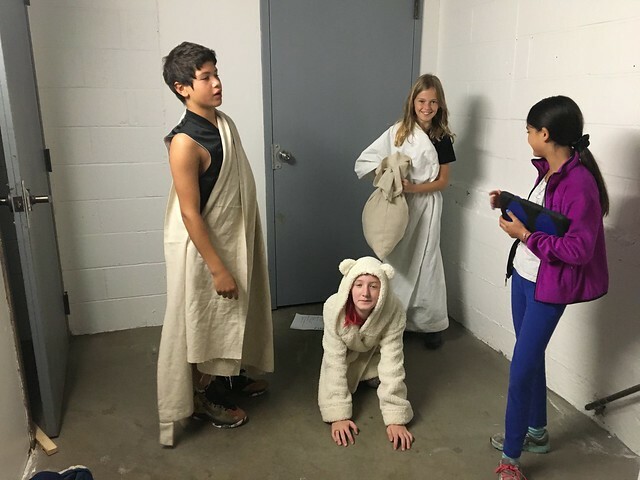 Students created a storyboard, wrote a script, planned and created costumes and props, and are now in the throws of filming. Editing is the next step and we will hopefully have a world premiere of our movies for families next week! Over the summer, Liam and his family built a mini foundry that they’ve been upgrading and modifying in order for the Green Band to make aluminum coins. 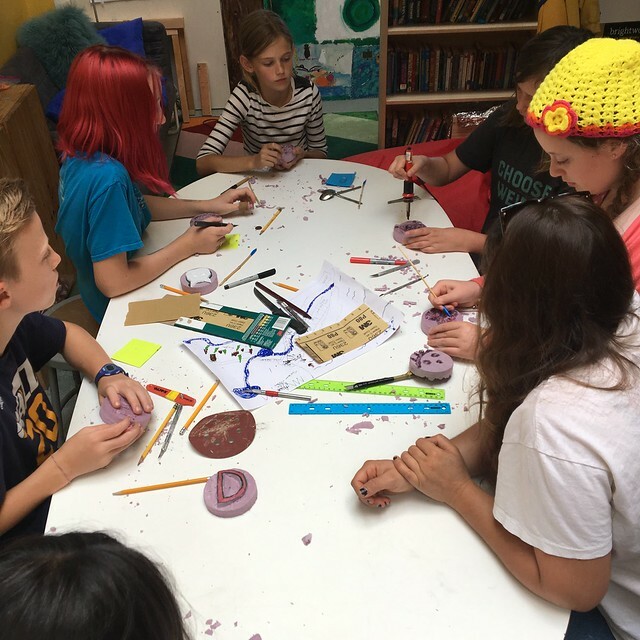 The actual casting and melting will take place during the last week of our arc, but students have been busy designing their coins and carving their molds. Pulling from the identity work we did earlier in the arc, students started by reflecting and sketching out designs they would want on their coins to represent themselves. Designs were then simplified in order to fit the styrofoam molds and show up when casted. Rachel’s friend Rachel the Artist (and puppy Ozzy) came to BWX with some professional tools to help us carve the styrofoam. Kids got to use a soldering iron and Xacto knives. Carving their styrofoam molds to make coins. Our big final project for the Arc has been our study of minimum wage. After listening to a podcast and reading an article on the debate surrounding minimum wage in our state and country, Greenies each picked a minimum-wage profession to role-play for the rest of our Arc. (We have 4 restaurant hosts/hostesses, 1 cashier, 2 home care aides, and a dishwasher.) 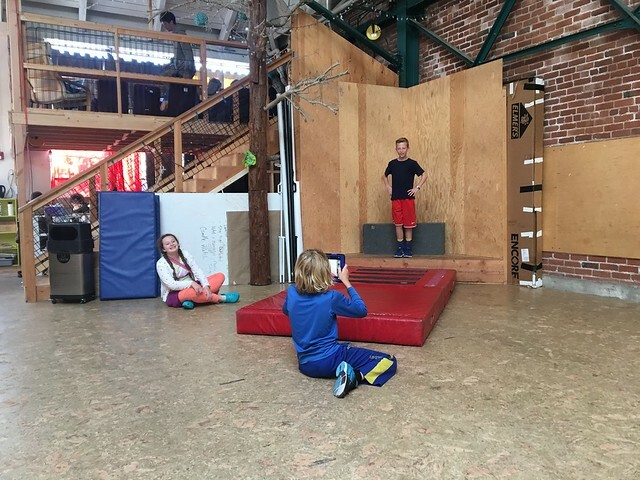 Many kids were shocked to hear that the average federal income is barely over $7.00. Students write journal entries from the perspective of these workers, research the positions, and next we will calculate their daily, weekly and monthly income and try to create a budget. With all these new projects coming up, it feels as if the Coin Arc has just flown by. Nonetheless we are super bumped for Cloth! We’ll report back soon.